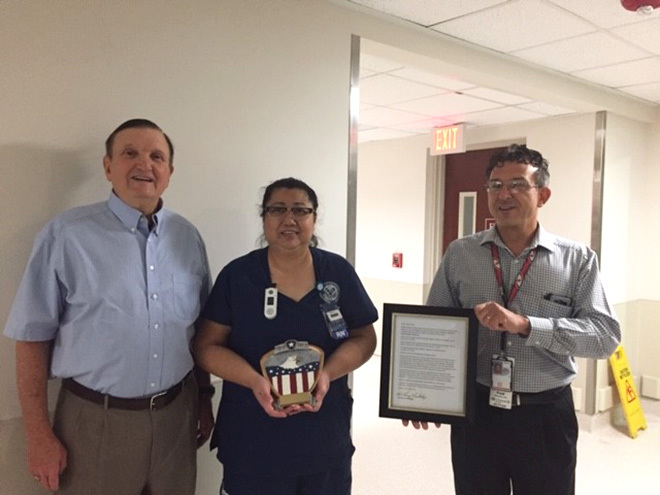 The Vice President for Veteran Affairs at the Association of the U.S. Army’s Charleston South Carolina Chapter, Larry Dandridge, presented the chapter’s Outstanding Service Award to Lydia Batista a Ralph H. Johnson VA Medical Center registered nurse, in early October. Batista was nominated for the award by retired Staff Sgt. and VA patient Eugene Williams, his family and Dandridge for the care she gives to her patients at the RHJ VA Medical Center in Charleston, S.C. The award was presented in front of her peers and supervisor at medical center’s Intensive Care Unit. From left: AUSA Charleston Chapter VP for Veteran Affairs Larry Dandridge, Lydia Batista, and Ralph H. Jonson VA Medical Center’s Chief, Community Engagement & Veteran Experience Fred Lesinski. The medical center is a Five-Star Hospital and has been rated in the top 10 percent of all public and private hospitals for quality of care and customer satisfaction for many years. It has the lowest turn-over rate of nurse employees of all civilian and VA medical care facilities in the United States. The center’s cancer program is accredited by the Commission on Cancer, American College of Surgeons; the laboratory is accredited by the College of American Pathology and the Self-Management Education program received national standards recognition from the American Diabetes Association. The Charleston Post Baccalaureate Nurse Residency Program is accredited by the Commission on Collegiate Nursing Education and there are 190 students in nursing trainee programs that is the only VA in the nation to offer three nurse residency programs. AUSA’s Charleston South Carolina Chapter adopted the RHJ Johnson VA Medical Center 14 years ago and is dedicated to supporting this outstanding medical center and its over 80,000 patients and families. The chapter has donated more than $20,000 to the center over the past 14 years and Dandridge, a long-time volunteer and assistance and advisor, wrote an award-winning book, BLADES OF THUNDER (Book One) that has raised more than $65,000.00 for RHJ VA’s Fisher House, Charleston.